Dr. Sathish conducts all of her holistic integrative services in a private, holistic vet center located at Bag of Bones Barkery in Mercerville Shopping Center, 364 Route 33, Hamilton NJ. The room does not look or feel like a 'regular, everyday' vet office or exam room. In fact, there are no exam tables whatsoever. Dr. Sathish prefers to allow your pets to settle in where they feel most comfortable, and she performs all of her therapies there. 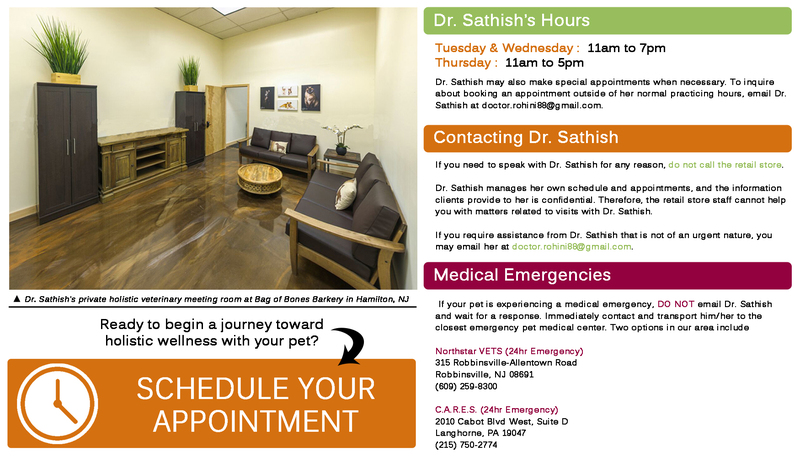 Whether it's the leather sofa, the low wooden coffee table, on the plush faux sheepskin HuggleMat or even on the painted concrete floor, Dr. Sathish will respect your pet's preference and go to him/her wherever they choose to place their paws. The holistic center is a private space where conversation and information can flow freely, without the feelings of stress and expedience. At 500 square feet, it is an open space free of clutter and excessive 'infrastructure' that allows your and your pet ample room to 'move around' as necessary. The room features two separate entrances -- one through our training area and one through a more private hallway -- to allow anxious and/or stressed pets to enter or exit in a manner that is the least stressful for them. A public restroom is located just outside of the room for the comfort of our pet owners, as well.